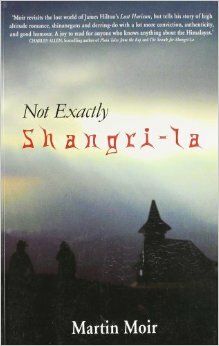 This story, by Martin Moir, revisits the Shangri-la geography of a small, fictional Himalayan nation. However, it differs from James Hilton‘s book, Lost Horizon, in that Moir’s fictional country, Kalapur, is not isolated and living a peaceful life directed by its own leaders. Himalayan politics from India, China et al, along with big finance from international banking, are sticking their noses into Kalapur’s affairs. Internally there are rebels, ambitious politicians, a government of doubtful legitimacy and a lot of ordinary local people wanting an improved standard of living. Lies and rumours abound; there are even tales of dangerous Yetis. Into this mixture stumble Timothy, a young British historian, and Huma, an Indian conservationist taking the daring step for a woman of travelling alone. Both of them have been recruited to a project to publish a history of Kalapur. But whose version of history? Although described as a thriller I felt it was more a mystery, with a development of numerous clues to something not quite right eventually leading to an understanding of a lot very wrong. There are some thriller-type moments – Huma is locked in a cave and Timothy has to run from a soul grabbing medium. Despite there not being a shoot-out on every page the plot is gripping. New problems and questions arise at every turn the characters make, and the feeling of a huge threat waiting to burst forth gradually increases. The characterisation is spot on – both the protagonists and the, often colourful, people they deal with are rounded and realistic and act in logical fashion. It is when we come to setting that we are really in the realm of a brilliant book. The author has lived in India and is a specialist in Oriental affairs. He has written a number of non-fiction books on his academic subjects. He makes good use of his experience to portray an authentic place inhabited by believable people. The quandary that many of them face – of wanting to modernise while holding on to their traditions – must be something that people in all developing countries have to deal with. I recommend this book to anyone who likes reading about exotic locations, mystery and ordinary people dealing with bizarre situations. There is even a romance between Timothy and Huma though it isn’t a large part of the story. You’re very welcome. I’m glad you liked it.